on of the largest national florists, too. Flowers are magical. Plant a flower, give it water and sun light, and the stem will grow and the petals will widen and blossom. It's a natural process. But keeping a flower beautiful after it has been cut and somehow improving on its beauty takes a special talent unique to a professional florist. The family business that is Phillip's Flowers and Gifts of Chicago's western suburbs has succeeded in this endeavor for 82 years. The Phillip family was nurtured with a solid set of values and the same delicate care they use to nurture so many beautiful roses, tulips and violets. Just as flowers grow, bringing color and beauty to enrich people's lives, the Phillip family has grown up to enrich the family business. The family cultivated three generations who worked side-by-side to expand a tiny floral business into one of the top full-service florists in the nation. No longer the tiny store that opened in 1923, it now has three websites, a 30,000-square-foot design center, 10 stores and 250 employees. Phillip's Flowers is ranked among the top 1 percent of North American florists for its computerized nationwide, and worldwide floral delivery. "They're really dedicated to their family and their customers, even to their suppliers," said wholesale florist Roy Houff who worked in floral design at Phillip's Flowers in 1967 before starting The Roy Houff Company in Chicago. "The thing I appreciate about them is that they're honest and fair. And they're always a step ahead of what's going on in the market." For all its successes in serving customers, the community, and the industry, Phillip's Flowers and Gifts is being honored by the Illinois Retail Merchants Association as its 2005 Illinois Retailer of the Year. When James A. and Helen Phillip raised their three children in an apartment above a small flower shop in Cicero in the 1920s and '30s, they shared the work and the rewards. Their three children, J.R., Loreley "Lee," and Russell, helped out from an early age, developing a work ethic and learning skills for a lifetime. J.R. pushed a broom as soon as he was tall enough; as a teenager, Lee remembers the entire family staying up until the wee hours of the morning making corsages to fill orders from soldiers during World War II; Russ - the youngest - carefully watered plants in his father's greenhouse every Saturday and worked holidays throughout his youth. Each of the founders' three children continued to work in the business as adults. Only Lee Phillip Bell, who worked full-time at the store after graduating from Northwestern University, changed professions, moving on to a stellar career in radio and television, creating television shows "The Bold and the Beautiful," and "The Young and the Restless" with her husband, the late William J. Bell. But she kept close tabs on her family business, eventually returning to serve on Phillip's Flowers Board of Directors. "Mother and father really believed the family working together made a big difference," said J.R. Phillip. The family philosophy continued into the next generation. J.R.'s sons spent many Saturdays in the family flower shop as kids. Eventually, Russ' children did, too. Today, five of their children hold managerial positions. "My father would not only be thrilled, he would expect it," said J.R. "It's a way of life. What he taught us was, you work together, you play together, and you live together. I see my eight grandkids all the time. That's wonderful. I see my sons all the time. I see their wives all the time. It's a great family working together and playing together. Anything different would be foreign to us." The Phillip men all have a love for the business, a belief in hard work, and a deep loyalty to family. Derek Phillip recalls interviewing for a couple of jobs after earning his business degree from Arizona State University in 1997. But he figured if he was to invest time and effort for a business, it might as well benefit his family. It didn't matter if that meant working long hours, including weekends. "We've always been told if you want something, you've got to work hard for it," Derek said. "I've seen everyone else in my family putting in a lot of hours, giving a lot of effort. It's not a big deal to us." The Phillip children always knew if they wanted to see their fathers, they had to work with them on the weekends, pushing a broom for a few bucks. The older Phillip men continue to set an example for hard work. Despite his age, J.R. still works daily, arriving as early as 4 a.m., and Russ considers 60 hours a light week. "I think the work ethic that started with the founders continued with their sons and then grandsons. They just out-work anybody," Houff said. The Phillip's family legacy begins with a story of working hard and putting family first. James A. Phillip, the son of immigrants, had to quit school in seventh grade to help put food on the table for a half dozen siblings. He started working in Chicago as a florist's delivery boy, riding streetcars to deliver bouquets, and quickly became a designer. James liked the business enough that he and his wife, Helen, started their own floral shop in Cicero in 1923. By 1928 they put up their own building on West 22nd Street, with a shop on the first floor, a greenhouse out back, and two floors of livings quarters for the Phillip family above. "As family businesses go, they were true craftsmen. They weren't necessarily promoters, just great florists and understood the craft and served their customers well," said J.R.'s son, Jim Phillip. Their children soon understood the craft and the importance of customer service. Naturally, they followed their parents into the business. By 1948, J.R. had earned a business degree from Northwestern University. He had his own ideas about the family business and suggested opening a second store. While his father had his doubts, J.R. convinced him to expand, and in 1951 opened his own store in suburban LaGrange Park in one of the area's first shopping centers, the Village Market. The first year was difficult, but sales at the new store increased 50 percent the second year. "It was then that I knew we had something, and I never looked back," J.R. said. In 1961, J.R.'s younger brother Russ, armed with a Speech Degree from Northwestern University and a lifetime of floral experience, opened a third store in Oak Brook. The company blossomed in the 1960s and '70s, expanding with the population into the western suburbs. 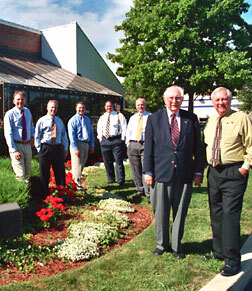 Under the leadership of James A. Phillip and his sons, J.R. and Russ, the third generation was raised to help the company grow. They now have stores in Lombard, Elmhurst, Wheaton, Oak Brook, Naperville, Westmont, Downers Grove, Hinsdale, LaGrange and Countryside, Illinois. Today, each Phillip's Flowers and Gifts store is about 3,000 square feet filled with a colorful variety of fresh cut flowers, plants, gifts and balloons. But a single Phillip's store represents only one piece of the entire business. This family-owned and operated company has three divisions and an affiliated wholesale flowers business, Flower Pak, Inc. Besides the stores, its facilities include a huge design center and warehouse in Westmont, and a commercial services building in Oak Brook. Each day it prepares about 500 arrangements for delivery in 150 suburbs and sends flowers, plants and gift baskets throughout the world through a network of 25,000 professional affiliate florists. Through its various websites and toll-free phone line, Phillip's handles hundreds of orders each day for flowers from customers throughout the U.S., Canada, and several other countries, too. In addition, Phillip's cares for blooming and green plants in many Chicagoland office buildings, designs and installs holiday decorations for businesses, and creates floral arrangements for a variety of special events. They've been recognized for their accomplishments. Phillip's Flowers and Gifts was one of 106 retailers honored in 2001 by IRMA in its celebration of the top Retailers of the 20th Century. They were voted the favorite Chicago florist in a Chicago Magazine's Reader's Choice poll, and Loyola University's Family Business Center named Phillip's Flowers and Gifts an Illinois Family Business of the Year in 1994. "It's hard to be an absentee owner in a business like ours," explained Vice Chairman Jim Phillip. "It's a seven-day-a-week type thing. You develop friends in a community, they call on you when they need flowers for a wedding or funeral, and you take a personal interest in their needs. I think the employees see that and participate in that. They see that the customer is valuable to the owner, so the customer becomes valuable to them." Their presence provides employees with a sense of stability, shared values and a common vision. That solid leadership is one reason many employees stay at Phillip's Flowers for years. "We've had employees as long as 31 years, hall-of-fame-type of employees who have helped to build this business," J.R. said. The Phillips are similarly dedicated to their customers, who are treated as extended family. "The philosophy I was taught by my parents about people, and I've tried to pass on, was this: "A customer is a customer only for a short time. Then they become a friend. Get to know who they are, get to know their families. They will become a good friend for a lifetime," Russ said. He remembers his father, James, giving special treatment to a customer's young daughter. Years later, that young woman came back to the store for her wedding flowers and eventually, sympathy flowers when her mother passed away. They continue to serve the same family; only the generation has changed. "We tend to think of ourselves as doctors of floriculture," Russ explained. "When you serve a customer, it goes on for a lifetime. Our customers do become extended family." The Phillips carry their concern for employees and customers one step further, through a deep commitment to the communities they serve. They offer their talents and resources to a variety of charitable groups in Chicago and the western suburbs. In addition, individual family members serve as volunteers and directors for several nonprofit organizations. The floral business has unique challenges within the retail industry. Its product is perishable, like food, and timing is vital as most orders are tied to special events such as weddings, anniversaries and funerals. Keeping enormous amounts of customer data and working efficiency are both important as product turns over fast and often - 365 days a year. For most orders, there is also a delivery process. That means a fleet of trucks, complex routing to dozens of local towns daily, and sophisticated computer systems to send and track orders outside the Chicago area. To complicate things further, Phillip's operates more than a flower delivery business. The company runs a commercial interior plantscaping and holiday decorating division, a retail division, and a design center group featuring a talented team of designers who create unique floral displays for weddings, funerals, parties, and special events. Despite the complexity of their business, the Phillips have built a reputation for high quality and great service. "They run a very professional business," said Red Kennicott of wholesale florist Kennicott Brothers, Chicago. "They're very hands-on, they know their customers, they know how to market, and they know their products. They do a great job at following through. You look at JR, he still does some of their buying, he stays on top of the floral market, and that's a market of perishables, it's always changing." A majority of the Phillip's business comes from people ordering flowers for anniversaries, birthdays or other special occasions. But big chunks of sales come from weddings and parties (10 percent), funerals and sympathy (20 percent), and commercial services (15 percent). It keeps the company busy seven days a week. "People don't stop having babies, being hospitalized, or mourning the loss of loved ones just for weekends or holidays," Jim Phillip said. "There is no day that we're closed. We're not a 24-hour operation, but we're open every day of the year." To help the company's 10 stores operate as one, the Phillips remodeled a former roller rink just off of Ogden Avenue in Westmont as its design center. While each branch shop still designs and delivers direct, the design center allows for more productive centralized efforts. More than 70 percent of Phillip's orders come in by phone or the Internet, with the rest coming through the stores. Phillip's operates multiple websites, including www.800florals.com for ordering flowers online, which corresponds to the company's nationally known 1-800-FLORALS phone number; and www.phillipsflowers.com for its commercial interior plants and displays divisions. While Internet users can easily buy flowers from the Phillip's sites, there is a variety of other information available to them as well. They can request a catalog, forward their comments, learn about flower care, or sign up for a free e-mail reminder service. The company also runs www.iflowers.com, a site offering free virtual flowers. It remains one of the better vehicles for introducing the company to prospective customers. The company's fleet of 40 trucks provides another strong vehicle for marketing. As the trucks roll throughout the city of Chicago and its western suburbs, they serve as moving billboards for everyone to see. Corporate and military contracts help generate the daily demand for Phillip's. They are contracted as a preferred florist for U.S. Navy personnel worldwide. When men and women at sea want to remember someone back home, they send orders through Phillip's Flowers. They've had similar contracts with the Army and Air Force, the Veteran's Canteen Service, and corporate customers. Through its affiliated wholesale company, Flower Pak, Phillip's buys directly from importers, manufacturers and farms around the world, creating a savings it passes along to its customers. They work with other wholesale florists when they need a specific flower right away or weather issues impact the availability of shipments. Just as the Phillips' family and their business has grown, so have their affiliations within the industry. Jim serves on the American Floral Endowment Board, which funds research to make products better across the floral industry. Before that, he served on the Society of American Florists. The company is also a member of IRMA, citing the group's strong legislative team and money-saving programs. Soon, the fourth generation of Phillips may dive into the business, continuing with the long-held family values of working hard and nurturing both flowers and family. Several are high school and college age and have already been working at Phillip's weekends and summers. Others range from only two months old to early teens. With so many Phillips representing the quickly growing fourth generation, the family will soon ask a very important question: Can a fifth generation be far behind? J.R. has complete confidence it won't be. Courtesy of Illinois Retail Merchants Association. For additional information or to send flowers almost anywhere, click on Phillip's Flowers Online, or visit one of the Chicago area Phillip's Flower Shops near you (in Lombard, Elmhurst, Wheaton, Oak Brook, Naperville, Westmont, Downers Grove, Hinsdale, LaGrange and Countryside), or call (630) 719-5200.